Whenever visitor numbers gets to the next 1,000, I am compelled to write something. Whenever the total number of visitors inches towards the next notch of 1,000, I feel an urge to write a blog post. Somehow, knowing that I can influence my blog statistics gives me a sense of urgency and power. But the visitors that arrive at the Concertblog are not necessarily lured by the latest blog post. There is a time lag. Search engines drive the traffic here. 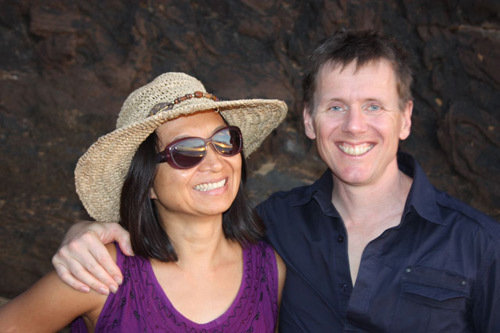 Originally this blog was intended to chart the adventures of our piano guitar duo as we travel and perform in Europe, USA, and Asia. Except, we are now on sabbatical. Robert is pursuing his doctorate in the musical arts (DMA, for short) at the New England Conservatory in Massachusetts. I am teaching piano and running a electric vehicle project in Hawaii. We don’t get to perform or rehearse together. You can find our music online in video format (youtube) and discography. Below is probably one of our earliest rehearsals captured on video — in Ealing, London, 2003. Bekkers Piano Guitar Duo recalls the birthday concert in Amsterdam, including the well-received piano-guitar premiere of Mark Francis’ Guitar Concerto. Unlike the Chinese who consider a birthday worth celebrating only if the age ends in a zero after retirement, the Dutch happily celebrate every single birthday. It’s the one day in the year, your family and close friends can turn up at your door uninvited and unannounced. When you arrive, you’d congratulate everyone else — not just “happy birthday” to the one whose birthday it is. Our first booking for a birthday concert was made by our next-door neighbour as a surprise 50-year birthday gift to his wife who loved classical music. He hired us to give a one hour concert in our own home. Afterwards we were invited to join them in their home for a chef-catered dinner and festivities. Last month, we were asked by the producers of the Funen Concerts Art Productions in Amsterdam to provide a half-hour programme (1 page PDF) for a private concert for the birthday of an architect. 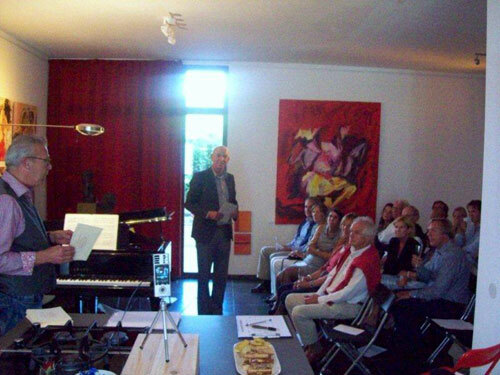 We have given many one-hour performances at Funen Concerts or FCAP for short. Each time there was a different art exhibition, for the owners turned their home into an art gallery. While it was easy to include the more popular pieces from our 2011 and 2010 concerts, we thought we’d add something entirely new: a movement of a new guitar concerto. Award-winning American composer Mark Francis had written his second guitar concerto for an orchestra in Jackson, Mississippi. Unbeknownst to us, our performance on Sunday 17th July 2011 was the world premiere of the piano and guitar version of the concerto. There was a buzz not commonly found in our audiences. Because it was a birthday celebration and a gift of the birthday gentleman to his guests, the concert was received as a gift. These were not ticket-holders but recipients of a gift. We, as performers, felt the buzz. When we announced that we were premiering a new piece, we felt that buzz again. We mentioned that new music was not as well received by general audiences in the USA as it was here in the Netherlands. In other words, we dared to include a new piece by a composer not known in this country at a privately commissioned concert. To our surprise, the audience smiled. They welcomed such a new work. They felt privileged that we’d select this occasion to premiere a new piece whose orchestral debut was less than two months before. After the 45-minute concert, one lady approached us as we were leaving to tell us that she specifically enjoyed the modern piece. We did not know enough about the work or the composer to share with the audience. As with good works of art, each time you visit, you enjoy it more than the previous. The first time we played it, we thought there was potential. But we had only rehearsed it three times together before we performed the first movement which we thought was the shortest and easiest of all three. What does the guitar concerto sound like with a real orchestra? We had no idea. Bekkers Piano Guitar Duo’s own arrangement from Gene Autry’s version of Peter Cottontail song is now available. In the quest for sheet music for “Here comes Peter Cottontail,” the song made famous by Gene Autry in 1950, I discovered I could not download the plug-in successfully to a computer attached to a printer. Thus I could not order the sheet music for the Easter Sunday lunch concert tomorrow. That version is not the one I heard on youtube. A Dutch oboeist friend commented on my Facebook status that a Dutch French horn player friend had the wind quintet version of “Peter Cottontail.” This led me to suspect that wind instruments were used in the original version. Dutch guitarist Robert Bekkers captured that in his transcription from the Gene Autry (1950) version of this popular song. Click on the image below to get page 1 of the 3-page arrangement in PDF. This is a result of a cross-world collaboration through Facebook, phone, email, Sibelius notation software, Adobe PDF-maker, …. Utrecht — 12 hour time zone difference — Hawaii. If you would like the remaining 2 pages of the above piano arrangement with guitar chords and lyrics, simply order a CD from us via CDBABY, and I will be happy to email you a copy of the PDF for free. Musicians exchange CDs when they meet each other. CDs convey more than business cards. Bekkers Piano Guitar Duo exchanged many CDs on their USA tour. The practice of exchanging business cards is translated into the exchange of CDs when musicians meet. A CD says more about your music than your business card. The first CD we received on our 5-week USA tour in 2010 was the solo guitar compositions played by Frank Wallace, the composer himself. The second was Duo Live Oak, the duo with his wife Nancy Knowles whom we’ve yet to meet. Frank organised our second concert in Boston, in the home of Karen Parsons in Newton, Massachusetts. That CD marked the beginning of our journey in discovering remarkable individuals who took time from their passionate pursuit of music making to help us with ours. In fact, our first three concerts were organised by musicians: Peter Terry of JP Concerts in Boston, Frank Wallace, and Mark and Beverly Davis of Hampton, Connecticut. We listened to the CDs of Frank Wallace and “Ayres and Dances” CD of the guitar duo of Mark and Beverly during our drive through Massachusetts and Connecticut: autumn in New England. In Durham, North Carolina, we exchanged CDs with Elaine Funaro, master harpischordist and executive director of the Aliénor Harpsichord Competition. The Aliénor Sampler is a demo CD of live recordings of selected pieces from the competition, recorded in 2008 and 2009. Elaine also gave us “Incantations & Inspirations Duo d’amore” a nicely wrapped CD of new music for baroque oboe and harpsichord. By the time we ended our mainland USA tour and arrived in Maui, we had exchanged many CDs with our “Summer CD” — our first album. Only then, after we had found a place to live and produce the next 3 albums, did we have time to listen to the CDs that we collected. Only then did we put the music to the names and faces of those musicians we met on tour. Two year anniversary of Concert Blog today! 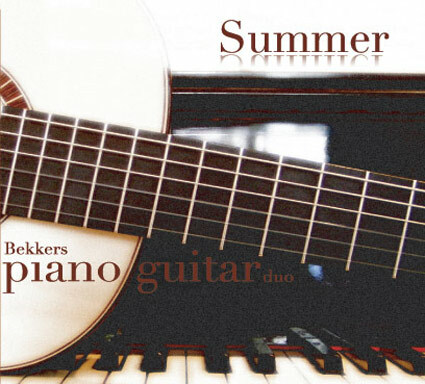 Bekkers Piano Guitar Duo’s concertblog on wordpress.com began 2 years ago. Time to categorise the topics. Hard to believe that it has been exactly 2 years since we launched the Concert Blog on WordPress.com to document our adventures and discoveries in music. Since our first blog on 24th March 2009, we have evolved from writing about our duo to reviewing concerts and sharing insights into cultural economics of concertizing. The two-year journey has taken us from the Netherlands to England, Crete, Belgium, Spain, Finland, Denmark, Italy, France, Taiwan, and the USA. In addition to the musicians and composers who have actively contributed to our concertizing and exploration in the world of live and recorded music, we have worked with artists, photographers, film makers, and other interesting people from all walks of life to make concerts happen. What we learned, we shared. We are grateful to all the feedback from readers and audiences everywhere. It is now time to categorise the different topics and make it easier for readers to access from our Blog Page. Time to celebrate! But Robert flies to Phoenix tonight and Anne to San Francisco in mid-May. Author BLOGmaidenPosted on March 24, 2011 March 24, 2011 Categories articles, audience, communication, composer, concert, culture, economics, personality, travelTags Bekkers Piano Guitar Duo, blog, Dennis O'Keefe, Hawaii, Maui, Netherlands, photographer, Taiwan, USALeave a comment on Two year anniversary of Concert Blog today! Robert Bekkers, guitarist, prepares his three week solo concert tour of Boston to Phoenix in February. 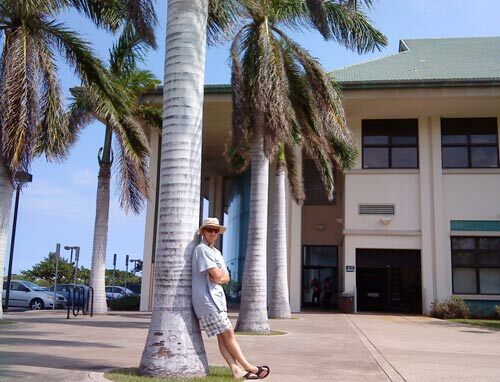 Five hours before Dutch guitarist Robert Bekkers boards the airplane for his trans-Pacific and coast-to-coast red-eye (overnight) flight from Maui to Boston, he finishes a hearty meal at the cafeteria of Maui College famous for its award-winning Culinary Academy. Every Monday to Thursday between 11 am and 1 pm, Paina Meals at $5 a plate are served. Today he chose the more expensive $7.90 swordfish with purple potato as a send-off meal. He knows that there will be NO complimentary meals served on Hawaiian Airlines and Delta Airlines for the long journey. That concert of “Guitar meets Piano” will take place on Sunday 13th February, a day of travel for Robert Bekkers on the Boston T-line and the Amtrak. Before then, he will have given two house concerts in Boston. Valentine’s Day on Monday 14th February will be another day of travel, by Amtrak from Wells, Maine to Boston and then the Peter Pan coach to Manhattan. What he brings to these concert hosts and their guests are three new CDs he produced in Maui: a solo guitar album and two live recordings of his Bekkers Piano Guitar Duo concerts in Maui and at Duke University. He hopes and expects the sale of these CDs to support this 3 week tour of Boston, Wells, Pelham, Houston, and Phoenix. 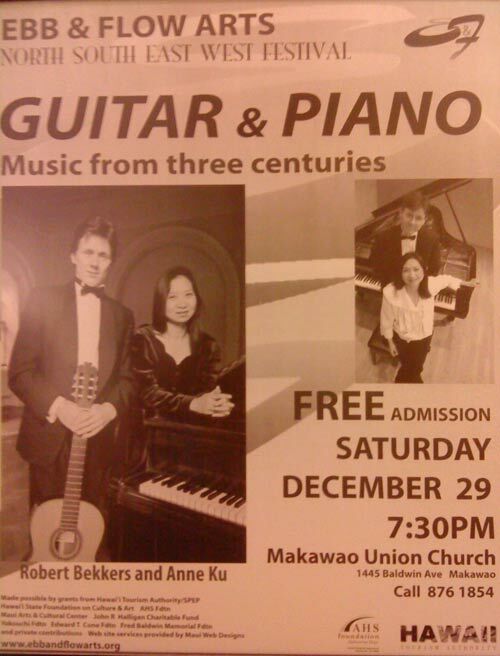 Bekkers Piano Guitar Duo releases Live in Makawao CD of their first public concert in the USA — 29th December 2007. Included are music for piano and guitar for 3 centuries. A framed poster of our first public concert in the USA hangs on my mother’s wall. It’s the only one that survives today. The CD will soon be available on CDBaby and at all concerts that Robert Bekkers plays on his solo concert tour. Our hope is that it will sell out to enable us to reinvest in arranging more music for piano guitar, collaborate with other enthusiastic music lovers and musicians, and encourage more composers to write for this combination. 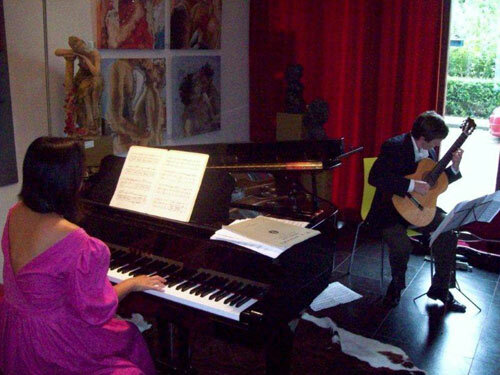 The piano and the guitar are rarely heard today as a classical duo. At this concert in December 2007, which has been recorded and released on CD Live in Makawao, you can hear original music written for piano and guitar from the 19th, 20th, and 21st centuries. While we have to research the origins of the earlier works, we have only to e-mail or speak to the composers in the 21st century. 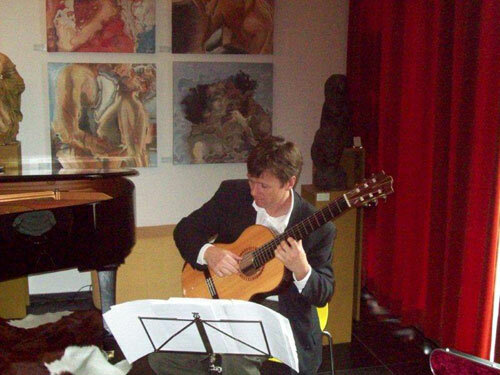 Haarlem-based guitarist and composer Erik Otte was the first person to write for our duo. He dedicated the 4-part Rio de la Plata to us. With South American influences, the music is about love. The first movement opens with a bang, symbolising a break-up. The fourth movement is very energetic (below). 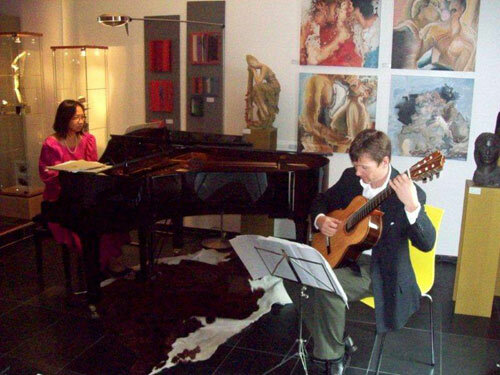 We invited Amsterdam-based composer Allan Segall to the premiere of Rio de la Plata at the “Mustard Seed” in Santpoort for he could not believe that a piano and guitar could be a feasible duo. After hearing Otte’s piece, Allan stood up and announced that he would write something for us. Segall’s “When JS Bach, Igor Stravinsky, and the Who Met” is a challenging and terribly exciting piece. It’s extremely demanding to get it together. Segall suggested that we watch “Tommy” to get the feel of the rock musical which is embedded in the piece. It’s the only work in which the guitar overpowers the piano. Once these pieces were added to our repertoire, we started actively looking for composers to write for our duo. Utrecht-based Henk Alkema wrote “Sailor Talk” on a programmatic subject he knew well for he loves sailing. We premiered it at the Cortona Contemporary Music Festival in 2007. At the same festival, we played Toronto-based Lan Chee Lam’s “Drizzle.” The Dutch audience especially love this piece — kind of oriental and exotic. Lan Chee is the youngest composer to have written for our duo. 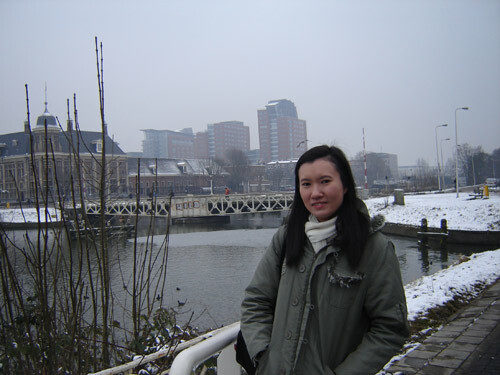 She finally came to the Netherlands in January 2010, for the premiere of another work of hers.